With focus on body awareness and partnership for strong and happy horses. My name is Maria Homström (Pihl) and I teach the Academic Art of Riding in the west coast of Sweden, in the Göteborg area. To me Academic Art of Riding is a beautiful form of art with focus on body awareness and partnership with the horse. To build up healthy horses that joyfully perform their work. That is for me true wellness for the horse. Here on my site you can find my blog where you can take part of my life with horses and Academic Art of Riding, how I am training and philosophizing about horse life. 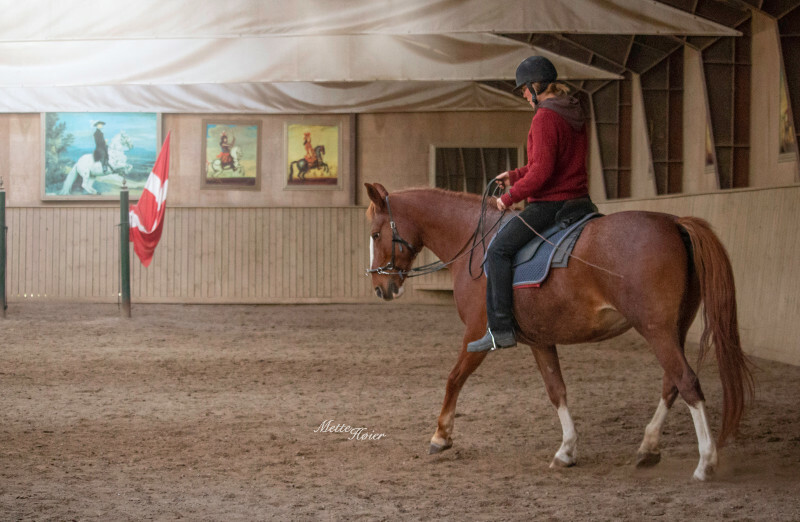 In my free online course “AAoR school“, I have written a bit more in detail about how to start with Academic Art of Riding and how to develop your senses about horses. Academic Art of Riding is based on how horses were trained back in the days and is building on the knowledge of old masters like Xenophon, Pluvinel, Guérinière and Newcastle, to mention a few. Bent Branderup reinstated this form of art and his motto is “Two spirits who want to do what two bodies can”. He created the knighthood of the Academic Art of Riding with knights and squires and is now reaching out with the message that dressage is for the horse, the horse is not used for dressage. Dressage is used to build up strong and healthy horses and not mainly to collect rosettes. The goal is to make the horse able to carry itself and its rider in a healthy and sustainable way. Read more about how to do it in the AAoR school. I am an instructor in the Academic Art of Riding and I offer both lessons and clinics. I can also train your horse for you. I’ll drive to your stable to allow you to train in the comfort of your home environment. 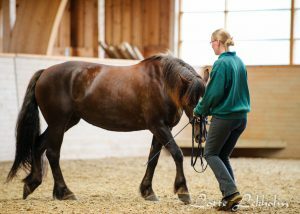 Maybe you want to discover a new, soft and nice way of working with your horse and need a trainer to guide you? Or do you have a so called problem horse with bad habits that you want to break the pattern with for you and your horse can become a well functioning team? Or maybe your horse has been hurt and now you want to start training again in a different way than you did? Maybe you want a well mannered horse that is nice to ride in the forest? Or maybe you want intense training in the Academic Art of Riding, or rehabilitate your horse? Regardless of your goals I am happy to help you. Read more in lessons. Today was the first time I was riding my horses again after starting my Franklin method training. It was an amazing feeling in my body and my horses were doing great. What did I do? Well, today I just used my imagination and recalled the feeling in my body that I had obtained in the Franklin method equestrian pelvis training. In the Franklin method training we were learning a lot about anatomy and movement of the pelvis. This included bones, muscles, fascia and movement in the joints. The hip joints were of course also included as well as the sacrolumbar connections. And of course the pedagogy of the Franklin method was taught, a pedagogy I very much like. It is really learning by doing. If you can feel a difference in your own body, and it is a difference to the better, you will be more likely to use your new knowledge than if you know all the little bony points in the pelvis region but you have no clue what to use it for. Even if imagery is the corner stone of the Franklin method it may be most known for its balls and bands. By using balls and bands on our body and in the saddle when riding we can improve our proprioception, the awareness where our body parts are placed in space and in relation to other parts. During the Franklin course we were riding the mechanical horse Martha, using imagery, balls and bands, and it was very efficient in creating a better seat. Today when I was riding my horses I didn’t use any balls or bands, but could still copy the feeling I had during the course. It was present in my body memory and I was imagining things like crazy. There were springs in my joints, a pole through my body, my clavicles were free and shining light into the world, I had dolphins jumping with me and I imagined my legs as attached by strings to my pelvis, so they could hang long and loose. And I was breathing deep, oh so deep. It was really great fun and the horses were responding to it by being great! Do you want to know more about the Franklin method? Well, I need some “guinea pigs” to practice teaching the Franklin method. I will teach for free but won’t drive too far. You can of course always come to me with your horse, then there is a paddock fee of 50 SEK. If you are interested please send me an email: info@maripihl.se or contact me on facebook. How are we supposed to sit on the horse? To the inside, to the outside or equal over the horse? Should it vary when we do different exercises? You sure can get confused, because you can hear about all sorts of different ways of sitting. When talking about the seat we need to think about what we want to accomplish on the horse back. In Academic Art of Riding we want to educate the spirit, mind and bodies of horse and human. We want the horse to be able to carry itself and us in a good way, that does no damage to either horse or human. But how does a horse carry properly? 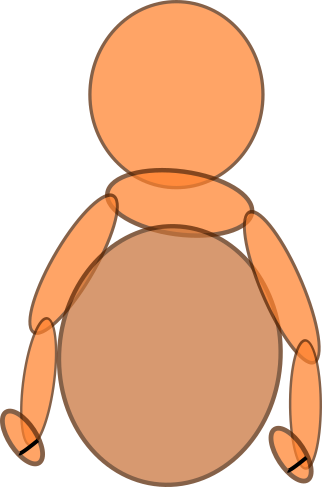 All four legs must go in one direction, with hind legs stepping in under the seat of the rider and front leg stepping in under the muzzle. As the inside hind leg moves forward the inside hip should come forward and down. 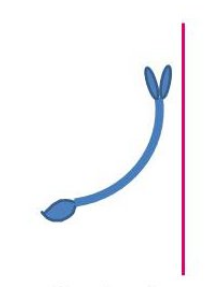 The belly then rotates to allow space for the inside hindleg. It is actually not just the belly that rotates, but the whole spine of the horse, from tail to neck. This is called bending and it goes along with stellning. Stellning is the rotation of the skull, where the inside lower jaw is moved in the direction under the wing of the atlas, the first neck vertebrae. However, for this to happen the head must first be searching forward. 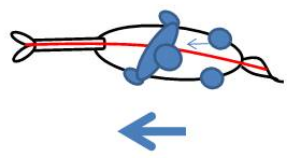 If the head is held back there is no space to rotate and obtain stellning. Here are some pictures to show when stellning is and is not possible. The bending of the horse can be seen as a rotation of the chest. The inside gets lowered and the outside is raised. The raised outside chest brings along the outside shoulder, that will be lifted and free. The Duke of Newcastle once said the inner leg should appear lower than the outside, and this is because of the rotation of the chest. Bröta rotated her chest and let me down on her inside. Hence my legs appear unequal in length. My inner leg is working downwards and my outside leg is working upwards. Now we know we need chest rotation for a proper bending and stellning. If we allow our inner seat bone and inside leg aids to go downwards when the inside hip is moving forward down, and the outer seat bone and leg aids to go upwards we can maintain the chest rotation and hence bending and stellning. If we press down our outside seat bone we will spoil the chest rotation, the bending and the stellning, and create some hideous curves in the spine. This is unhealthy for the horse and the rider. This gives the answer to how to sit on the horse. We must always sit lower on the inside and higher on the outside seat bone. However, note that there is a difference between lowering your inner seat bone and hanging all of your weight on the inside. You may experience some difficulties lowering the inside seat bone, but then you may try to lift the outside one. Some seat lessons to become aware of your body, pelvis and movements may also be a good suggestion. Good luck! If the horse is moving its hindlegs in under the seat of the rider and the front legs in under the muzzle it is doing its basic job. It is carrying itself and the rider and you will experience softness in your riding. When the legs of the horse are not doing its job you will notice this in different ways, depending on the horse. Some loose everything and fall all over, wobbling here and there. Some lower their back and put the muzzle up in the air, some go too low, some just loose a bit of stellning. There is a whole range of ways to loose it, ranging from minor issues to big ones. We need to figure out which leg is not working properly and then adjust it. If we allow ourselves some time and stop all negative voices in our heads about how difficult it is, we can just sit and feel our own body and the body of the horse. What is it that we sense? Most of my students do feel what is happening if they just give themselves a little bit of time and get explained what to look for. Mira and me working on getting the legs in one direction and increasing the softness. As seen in the picture this is a bit difficult, but we just stay soft and continue working on getting the legs more and more correct. For the horse to move properly we need to stay out of the way of the horse, i.e. allow the movement of the horse to pass from the hindlegs to the front. 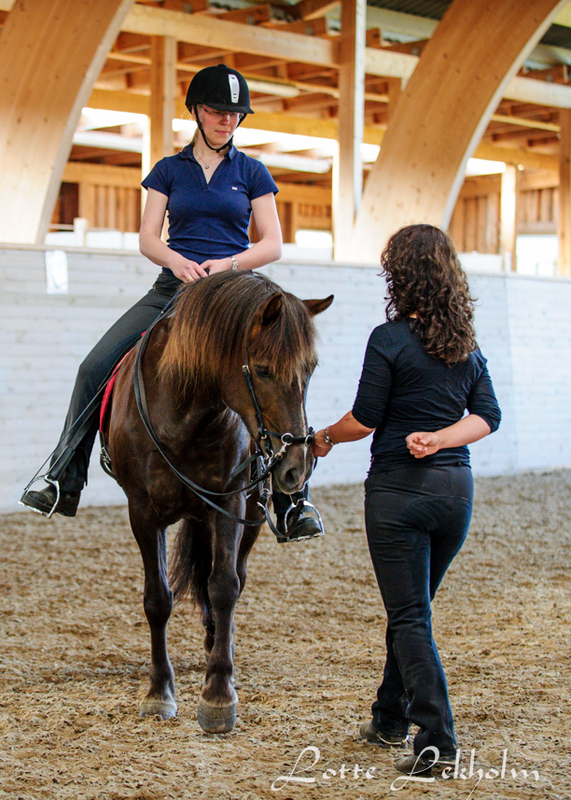 We need to first allow and then induce chest rotation of the horse, to get a proper bending and stellning. This means we have to sink down a bit on the inside seat bone and lift the outside. Still, you need to sit on both seat bones. If not, it is very easy to lose the outside. After all, the horse is a unity and all of it needs to be moving in the same direction. How well can you place the legs and how soft can the horse become? This is what your training should increase, little by little. In our efforts to get the legs in one direction, it is easy to press too much with the aids, maybe adding pressure and increasing it until the horse responds. 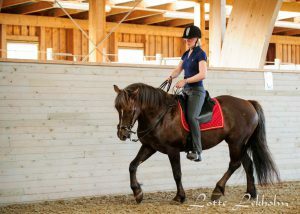 Adding a lot of pressure often means we lose our seat, and then of course it is more difficult for the horse to respond. You should try to always stay soft enough that you can maintain your seat. Use the whip as an extra aid rather than pressing too much, and if the horse does still not respond it probably either cannot do it or, most likely, doesn’t understand how to do it. Then you slow down and try again, or explain in a different way. The softer you can stay the better it is. You will be able to add your aids in a more precise way because when you are relaxed you can still feel what the horse is doing. If you press a lot then you will get stiff and you do no longer feel the horse. You will soon notice, that the softer you can stay, the softer the horse will be.